The Collect Lounge in the Welle 7 Concept Centre in Bern is a central parcel collection point. So that commuters do not have to carry the fashion articles ordered home unnecessarily, they can try on the articles they have ordered right there. There are innovative and spacious changing rooms available in the Collect Lounge. 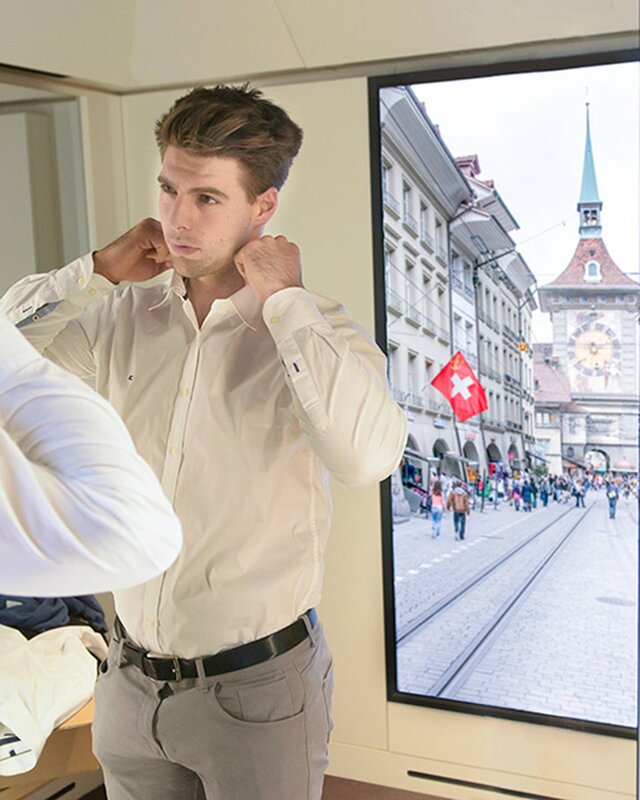 The special wow effect is provided by a digital mirror and a large-format background screen with pictures that can be chosen individually and a built-in touchscreen with a light regulation and music function. This means that a female visitor can travel to a virtual beach, hear the waves rushing and quickly discover which bikini suits her best. And what if she is uncertain and wishes to ask her colleagues for advice? No problem! She can use the touchscreen, which has a special smartphone holder, to take a selfie that she can then quickly share with them. After she has tried everything on the customer will then only take those items of clothing home she wants to keep. The rest can be put back into the parcel and returned easily via the Collect Lounge. Practical, modern and user-orientated! With digital room identification, Welle 7 offer a particularly innovative access and information system for available rooms. Welle7 informs, inspires and provides orientation regarding the most varied of digital touchpoints – from information and advertising platforms for store tenants to guidance systems for directions and courses at Klubschule Migros.